These hunting and fishing Bible object lessons do a great job to illustrate Satan's traps and snares. Recently a couple of men from our church shared with our Awana kids some interesting Bible object lessons on temptation and Satan's schemes. Now I had never seen a barrel net before, but they are very interesting. The opening at one end is very large and the smell of bait entices the fish into the net. The net then has two funnels into which the fish enter, but cannot go back out. Actually there is one small way out of the net, but the fish are trying every other way to get out once they are caught in the net. This is a wonderful illustration how Satan entices us into sin. It doesn't look threatening and the bait is so attractive. Once we are caught in the net of sin though, there is only one way out - that is Jesus. We can try other ways, but there is only one out of sin's trap. Matthew 7:13-14: "Enter through the narrow gate. For wide is the gate and broad is the road that leads to destruction, and many enter through it. 14 But small is the gate and narrow the road that leads to life, and only a few find it." John 14:6: "Jesus answered, "I am the way and the truth and the life. No one comes to the Father except through me." I may not be a hunter, but I do realize how effective snares can be. The danger is that they blend in with the natural surroundings. A snare captures an animal as he's going about his normal activities. It won't kill the animal, but it will bind its leg and leave it helpless. Satan can hide snares among the normal surroundings of our everyday life too. We can be caught unsuspecting if we're not careful to keep our spiritual eyes open and be on alert. It's important for us to listen to those that watch out for us like our parents or teachers. Also, we need to read and study the Bible because it warns us about Satan's snares and teaches us how to avoid being caught in them. A duck decoy is made to look just like a real duck. 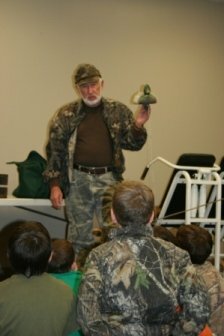 The hunter places it in the water, splashes the water to make it move, and then uses a duck call to make the sounds of a duck. Ducks follow a leader. As they hear what they think to be a duck calling to them, they follow. As they come closer, they get in grave danger because they're following a "fake" duck. Who are we following? There are many voices that call for our attention and want us to follow them. There are our peers (others our own age), television programs, movies, etc. We need to be careful who we follow. The one we should be following is Jesus. He's the "real deal" not a decoy! In Luke 21:8 Jesus says: " He replied: "Watch out that you are not deceived. For many will come in my name, claiming, 'I am he,' and, 'The time is near.' Do not follow them." John 12:26: "Whoever serves me must follow me; and where I am, my servant also will be. My Father will honor the one who serves me." Now I may not hunt or even fish with a barrel net, but as most Southern gals do, I enjoy fishing with a pole! This also is a great Bible object lesson to show how Satan can dangle something in front of us that looks good, but contains hidden danger just like the bait on a hook attracts a fish. That bait can be so tempting, but oh how careful we need to be because of the hook that hides within it! Fishing, however, can also be a positive experience when Jesus is the fisherman or "fisher of men." He does not tempt us, but gathers us to himself and asks us to share His love with others. Matthew 4:19: "Come, follow me," Jesus said, "and I will make you fishers of men." These are just a few of the many hunting and fishing Bible object lessons that can be used as a great way to illustrate the temptations that face us in this world. Every day we need to put on the whole armor of God spoken of in Ephesians 6 and also keep our eyes on Jesus!